My children can’t always be held accountable for hanging onto things. When they finally feel inspired, I look into their bin of discarded ponies, plastic fast food meal toys, and assorted paper bits, and swell with glee to be rid of it all. But then my eyes wander and settle on the pile of books sitting amidst the junk—books my child feels she has outgrown. I see a pile of memories, a past that I can no longer get back and already feels worlds away. My heart sinks and my chest swells with that feeling of pressure you hold back when you’re about to cry. Some books you never want to see again. Some books you read to your kids a million times and every word pains you. But when I looked at the Mercy Watson series teetering on my daughter’s pile of junk, I immediately remembered when my daughter wanted them. They were her first chapter books and a transition to something so much older. I felt sad and excited at the same time when we started reading them, the same way I felt when my son and I started Nate the Great. It meant something to be graduating from picture books just like it means something that my kids’ shelves are now mostly covered in more difficult books they can read alone. Each new stage takes them further away from me and those nights long ago when I’d point to words and show them in earnest how to understand the world. 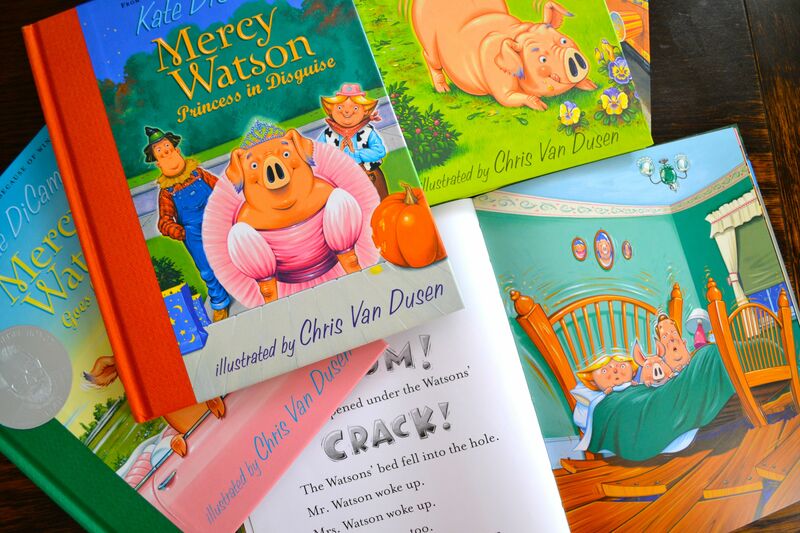 My daughter would never admit in a million years that she loved pigs at the time we started Mercy Watson, but she did—because they were pink. We’d snuggle in her bed at night and read several chapters. I didn’t do it for every book, but for these books, I had a special voice for every character. Crotchety Eugenia sounded like my childhood friend’s grandmother. We began those books not long after my daughter got her big girl bed. But what I remember more is when my daughter started reading them herself, a sign of the passage of time that I must have missed for she still looked like my baby to me. How could she possibly be reading them to herself? I’ve read to my kids every night since they could sit up. Since they were old enough to talk, we’ve spent the time after bedtime stories talking about their day, escaping and connecting. So the books we’ve read remind me of those times too—conversations about not feeling wanted that have broken my heart, the revelation of getting in trouble at school after pretending all afternoon that things were fine, and worry upon worry about the world. I snatched those Mercy Watson books from the pile yesterday. And there will be more. Some books have too many memories attached of nights with my kids, eras that have ended. For now Fancy Nancy still sits on my daughter’s shelf. I remember that phase when my daughter wore skirts over pants, strands of long beads, glasses with large frames, and purple plastic heels. It’s an image burned into my memory because it was a phase that passed too quickly. The books reminded me of the preschool her and they always will. I’ll always have images of her running through the yard singing in a tutu and pink cowboy boots or playing soccer in all her finery with her brother on the driveway, but I’ll never live that again. I imagine soon those books will end up on my shelves too. Some things I’m just not ready to let go.